Based in the German town of Glashütte, Glashutte Original produce exquisite timepieces that demonstrate craftsmanship and brilliance. With some models drawing on the styling of 1960s and 70s, the brand offers retro styling paired with dimensions to suit modern taste. Ranges include the Senator, Pano, Vintage, and Ladies. 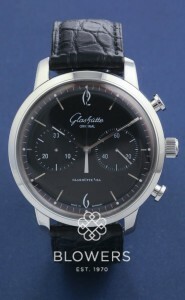 Browse our selection of unused and used Glashutte watches below. Looking for a specific model? Get in touch and we will endeavour to source it for you. All our watches come with a one-year guarantee. All pieces can be viewed at our Kingston upon Hull boutique, or by appointment at our London office in Mayfair.